Lung Disease – Cardiovascular Associates, P.C. There are many disease processes that may cause shortness of breath. Often these also result in changes spotted on the chest x-ray. The pulmonologist (lung doctor) has many tests to aid in diagnosis of the cause, but in some cases, a biopsy of the lung is necessary. 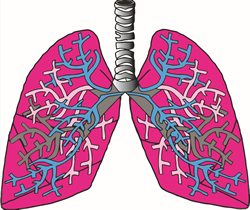 The cause of the lung dysfunction may be infectious, inflammatory, secondary to cancer or may be from an unknown cause. Lung cancer is a collection of abnormal cells which are found in the lung. Most tumors are associated with smoking. As the tumors progress, they spread to the lymph nodes causing metastatic disease. Pneumothorax is the development of air in the chest between the lung and the chest wall. This leak of air from the lung can be spontaneous, caused by trauma, or a complication of emphysema. Pleural effusions are the collection of fluid between the lung and the chest wall. These may be caused by infection, trauma, cancer, or congestive heart failure. Eventually, enough fluid builds to cause shortness of breath. 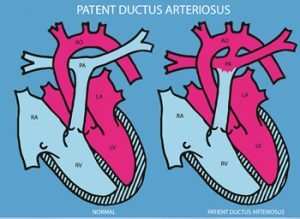 Patent ductus arteriosus is an abnormal opening between two major blood vessels-the aorta and the pulmonary artery. PDA is common in premature babies, but rare in full term infants. An opening or duct between the aorta and pulmonary artery is normal and necessary while the baby is in the womb; however, within 2-3 days of birth, this duct is supposed to close. If it does not close, the abnormal opening causes too much blood to circulate to the lungs and heart. Blood pressure in the lungs may increase and the heart may weaken. Fortunately, this congenital defect can be treated with both medications and surgery. Once repaired, the PDA rarely causes long-term problems. Pectus excavatum and carinatum are common congenital chest wall deformities. The sternal depression can limit the ability of the chest to expand during respiration and cause the heart to be repositioned in the chest. Often young children are asymptomatic, but by adolescence patients may exhibit recurrent respiratory tract infections, decreased cardiac output, and arrhythmias. Adolescents are often insecure about their deformity and this tends to lead to social withdrawal and the inability to participate in sports.